Your septic system / tank is meant to separate liquids from solids and to provide some breakdown of organic matter in the wastewater. However, if proper maintenance is not conducted on a regular basis, issues can occur that could impact your septic system, yard, home and belongings. The ground around the septic tank or over the leaching bed may be soggy or spongy to walk on. Toilets, showers and sinks may back up or may take longer than usual to drain. Occasional sewage odours may become noticeable, particularly after a rainfall. Gray or black liquids may be surfacing in your yard or backing up through fixtures into the house. EdenFlo offers preventive maintenance packages that will help you avoid costly repairs that can sometimes affect aging or neglected septic systems. Based on the age of your system and the number of people using the system, we will give you friendly reminders when it’s close to time to clean your system. Whether you live in Vancouver, Aldergrove, Surrey, Langley, Buranby, New Westminster, Delta or White rock, EdenFlo can provide regular septic service that includes a a routine maintenance inspection. Give us a call at 604 575 1414 or email us at service@edenflo.ca to book a complimentary consultation. This entry was posted in Aging Septic Systems and tagged aging septic systems, aldergrove septic tank cleaning, Aldergrove septic tank inspection, best septic service Delta, best septic service Langley, best septic service Surrey, Best Septic Service Vancouver, Best Septic Service White Rock, Best Septic tank service White Rock, burnaby septic tank cleaning, Burnaby Septic Tank inspection, commercial septic system maintenance surrey, delta septic tank cleaning, Delta septic tank inspection, New Westminster Septic Tank inspection, north vancouver septic tank cleaning, Pump Septic Tank Burnaby, Pump Septic Tank Langley, Pump Septic Tank New Westminster, Pump Septic Tank White Rock, septic tank maintenance surrey, septic tank pumping surrey, Vancouver septic tank cleaning on June 14, 2018 by Edenflo. Edenflo offers preventive maintenance packages that will help you avoid costly repairs that can sometimes affect aging or neglected septic systems. Based on the age of your system and the number of people using the system, we will give you friendly reminders when it’s close to time to clean your system. Call today and ask about our regular maintenance schedules, designed to make your life a little easier! This entry was posted in Aging Septic Systems and tagged Holding tank, septic field, Septic field cleaning, septic field cleaning vancouver, Septic Tank Maintenance, septic tank maintenance vancouver, septic tank pumping vancouver, Sewer cleaning, Sewer line cleaning on September 7, 2016 by Edenflo. Given what septic tanks do, many people might not realize how important it is to keep them clean. Of course, plenty of people probably just don’t want to deal with them for the exact same reason. However, it absolutely must be done. Continue reading about the risks of not cleaning your septic tank. There are a number of problems that could occur as a result of not properly cleaning your septic tank on a regular basis. Foul odours are a common and understandable one. However, you could also have sewage back up, through the ground and into your lawn or garden. The sewage could also build-up and cause blockages in the system itself. The septic tank could even back right up into your home’s plumbing system. An insect infestation can result if septic tanks are not maintained properly. White scum can also form around nearby drains or ditches. The toxic waste from your septic tank could also seep out into nearby wells or watercourses, which would be an obvious risk to public health. For the truly unlucky, runoff from an unmaintained septic tank could end up actually compromising the foundation of their home. Given the many potential problems that could occur from not caring for your septic tank, it’s important that you take appropriate measures. The most important thing you can do is to have your septic tank pumped on a regular basis. Most experts recommend having it done every 1 to 5 years, but it will differ depending on the size of your home and the number of occupants. It’s very important that you always hire a professional, like those from Edenflo, to handle the maintenance of a septic tank on your behalf. Septic tank systems may not seem like the most advanced of technologies, but in the hands of an amateur, they can cause all kinds of problems. This entry was posted in Aging Septic Systems, Septic Tanks and Field Cleaning and tagged consequences from not cleaning your septic system, Edenflo Septic Tank Cleaning, how your septic system works, Properly caring for Septic Tank, septic system woes, septic tank cleaning BC, Septic Tank Cleaning Delta, Septic Tank Cleaning Edenflo, septic tank cleaning Richmond, Septic Tank Cleaning Surrey, septic tank cleaning vancouver, Septic tank maintenance BC, septic tank maintenance vancouver on June 10, 2014 by Edenflo. If you have a restaurant or another company that is in the food service industry you are surely well aware that grease traps need to be maintained regularly or else they can start causing you some problems. Many things go down the drain and this can lead to things like clogging the plumbing in your building leading to the water not being able to flow through. The plumbing in your building can get clogged up and lead to water backing up, but the sewer lines around and near your building can also suffer clogs and this can lead to other area businesses and area residents also being affected and not being able to drain bathtubs or sinks, and not being able to flush their toilets, according to EdenFlo. Area businesses and homes can also experience flooding when sewer lines back up, causing raw sewage to flow into the house or building causing significant damage and posing potential health issues. If your building is affected by a sewer line backing up, you will need to immediately shut down until the mess is completely cleaned up, the building sanitized and disinfected, and the offending line fixed and this can cost you a significant amount of money. Preventative maintenance is key is keeping your pipes and lines flowing smoothly. You will have to have grease traps put in to help prevent how much grease is able to get into the drain and the lines and these are able to intercept the majority of the grease, but you still need to keep an eye on things to ensure that your lines are patent and not at risk for becoming clogged. Give us a call today to learn how we can keep your properties up to tip-top shape! This entry was posted in Aging Septic Systems and tagged grease trap, grease trap Edenflo, grease trap installation, grease trap maintenance, grease traps clogging, grease traps vancouver on September 12, 2013 by Edenflo. Hydro evacuation is a fast process that uses specialized water evacuating equipment that can quickly vacuum up debris, sludge, dirt, and silt safely. The process can be completed until the required depth and width has been achieved. The process of hydro evacuation offers a non-destructive solution that incorporates pressurized water and a high level vacuum system as an easy solution for digging. The process of hydro excavation also creates a quick way to visually observe any existing underground utility that could be harmed in a traditional evacuating (digging) process. It can significantly outperform all traditional excavators, augers, and horizontal impact drilling rigs. Typically, a conventional digging project would require bulldozers, augurs, bobcats and shovels. Every one of these tools can cause significant damage to many of the hidden utilities including electric cables, optic cables, water mains, sewage pipes, and most importantly, gas pipes. Many times, construction needs to be delayed, when an unexpected underground utility is located during the construction phase of any small or large project. This is where the process of hydro flushing and hydro evacuation can safely expose the sensitive utilities. Because the equipment has the ability to use non-destructive methods to evacuate most holes sizes, it can be used to quickly set signpost, utility poles, concrete forms, and anchors in the exact position where required, without any potential to damaging sensitive underground utility or wires. Because the system can so quickly evacuate all loosened debris, silt and sludge it provides the optimal working area. It minimizes the extensive restoration costs to bring the site back to its original condition. The hydro flushing equipment also has the ability to remove any buildup scaling, sludge or debris from the interior of a pipe or drain to remove the blockage immediately. Don’t delay and give us a call for a FREE quote and consultation. This entry was posted in Aging Septic Systems and tagged combo truck services for Property Managers, high pressure water flushing, hydro excavation aldergrove, hydro excavation burnaby, hydro excavation delta, hydro excavation surrey, hydro excavation white rock, hydro flushing burnaby, hydro flushing delta, hydro flushing Langley, hydro flushing surrey, hydro flushing vancouver, hydroflushing services, pump truck services Surrey, Removing silt and sludge carefully, Surrey hydro excavation on July 15, 2013 by Edenflo. Don’t Delay! Book your Septic System Inspection Today! 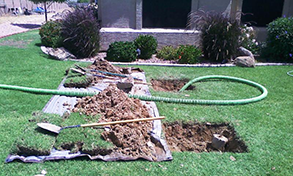 Performing routine inspection and maintenance on the home’s septic system is vital. Properly maintaining the entire system will allow the safe disposal of the home’s sewage system. Routine inspection and proper maintenance assures the homeowner of an operational, healthy system for many years to come. The septic system is a part of the home’s plumbing system that contains three essential fixtures including the tank, the system’s distribution box and the drainage field. All of the liquid waste from the home is moved to the sewage system, and enters the septic tank. As the waste and water begin to accumulate, all of the wastewater will naturally separate into the scum at the top layer, the wastewater in the middle, and the sludge that makes its way to the bottom. The natural bacteria inside the septic tank use the organic matter as its primary source of food. The residual material simply sinks to the bottom to create sludge. The wastewater then makes its way through the distribution box and finally out to the drain field, where it soaks into the ground below. Routine inspections are especially critical to ensure that the drain field is operating properly, and will last for years. Excessive rain and melting snow in the springtime requires an inspection and sometimes pumping of the tank to ensure the entire unit operates properly. Without a septic system inspection, it is very easy for the drain field to become clogged because the effluent water contains particles that should have been consumed by the bacteria, or fallen to the bottom as sludge. With proper maintenance, the entire septic system can last for decades. Without it, it can quickly fill up and stop working altogether. Do not delay. It is time to book a septic system inspection today, to ensure the home’s sewer drainage system is functioning properly. This entry was posted in Aging Septic Systems, Septic Tank Maintenance, Septic Tanks and Field Cleaning and tagged burnaby septic tank cleaning, delta septic tank cleaning, langley septic tank cleaning, Septic tank cleaning, septic tank cleaning BC, Septic Tank Maintenance, septic tank maintenance vancouver, septic tank pumping vancouver, surrey septic tank cleaning on June 6, 2013 by Edenflo. New Video: How Does Your Septic System Work? Check out our latest video showcasing how your Septic System works, and how through regular maintenance with Edenflo Pump Truck Services, you can avoid damages, and costly repairs. For all of your Septic Tank and System needs, give us a call! This entry was posted in Aging Septic Systems, Septic Tank Maintenance, Septic Tanks and Field Cleaning and tagged BC Septic system service, BC Septic Tank service, edenflo pump truck services, septic system cleaning, Septic tank cleaning, Septic Tank Maintenance, Septic tanks, Sump Pump services on December 6, 2012 by Edenflo.